London @ Gluten Free with L.B. 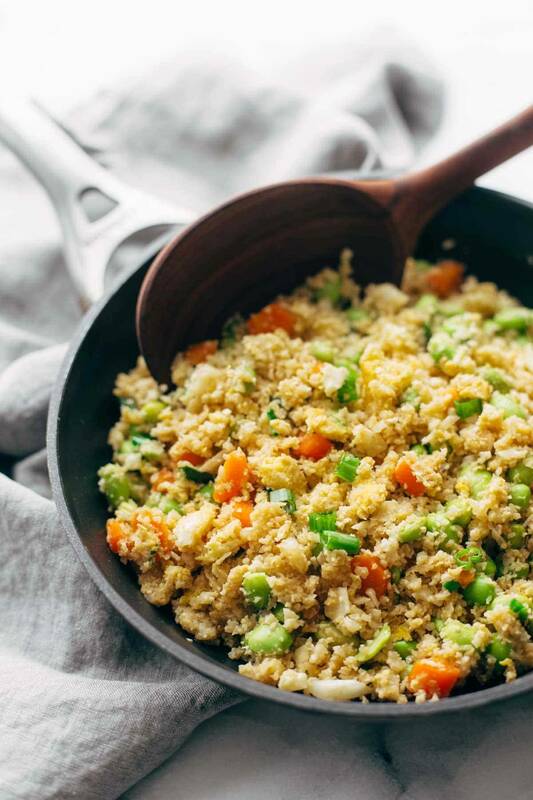 I have tried cauliflower rice once before but it was plain and not at all appetizing, this however looks pretty darn good! Thanks Bronwyn! I hope you like it! So glad I signed up for your emails! What better than a good ol’ easy Chinese lunch? Totes making it! I made this for my wife last night and we both loved it. I had to switch the edamame with peas per my wife’s request. Happy wife, happy life… right? This looks and sound amazing and I am so glad you included the nutritional information, I really appreciate it! I think giving up takeout and chinese food has been the most difficult thing for me on my quest to eat healthy. Recipes like this really help. I love this. Thoughts in using frozen cauliflower? Will that work? Good question. My fear with frozen cauliflower is that there might be too much moisture. We’ve never tried it, so we’d love your feedback if you give it a go! thanks for sharing this recipe. sure I’m gonna make this ASAP! I made this for Valentines Day. My husband said that it was the best thing that I ever made! And he absolutely loves my cooking, so this is a keeper. Going to make it again tonight and will add some pork. I made this with 2 bags of Trader Joe’s Cauliflower Rice, which is technically 6 servings of ‘rice,’ but followed the recipe exactly otherwise, and it turned out great! I ate two servings myself at once (but it’s so light, no guilt!) Because I had so much cauliflower rice, next time I think I will add 3 eggs vs 2 for a little protein boost and maybe some cashews for crunch. I did think it benefitted from more sauce on top, as well. Can’t say how the leftovers will fare, but I will definitely make this again! Nice and quick, easy and yummy! I made mine with red onion, a bit of diced fresh beets, 2 stalks celery & frozen peas. I used a bit of liquid aminos and red chili sauce. YUM! Maybe put the rice on the ingredient list? Hi Maartje! The “rice” in this recipe is actually the cauliflower, pulsed in a food processor. What is the serving size of this cauliflower dish? I am just wondering 1/2 cup, or is it more? Hi Tonga! We’re not sure on the exact serving size since it depends on the size of your cauliflower, but we’d estimate 1/2 or 3/4 cup. Hi Lindsay! Great recipe! Although it definitely took me more than 15-ish minutes to make my cauliflower rice! I had to grate my cauliflower on a cheese grater and I opted for few more vegetables. Lots of chopping! You don’t have to cook the cauliflower before you put it in the food processor? Loved this recipe! Used frozen peas instead of edamame (that’s what I had). I just shared the picture in Instagram. Thanks! 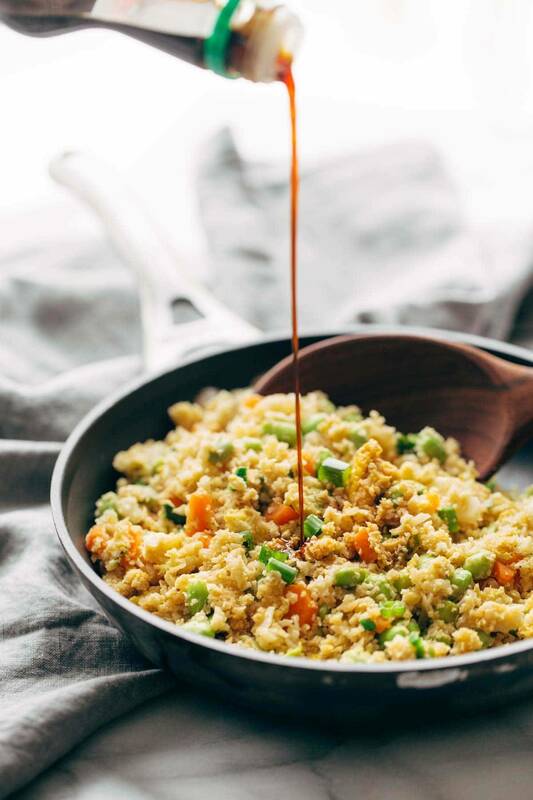 Trader Joe’s sells Cauliflower “rice” in its produce section so now it is even easier than ever to make it and you don;t miss the real stuff. That’s awesome! Good to know! OMG! Just made this exactly as written.. So delicious! And no guilt involved eating an extra portion! Glad to hear it, Lynn! Did you cook the cauliflower prior to shredding?